Thank you for your interest in one of ROCKLAND HYUNDAI's online offerings. 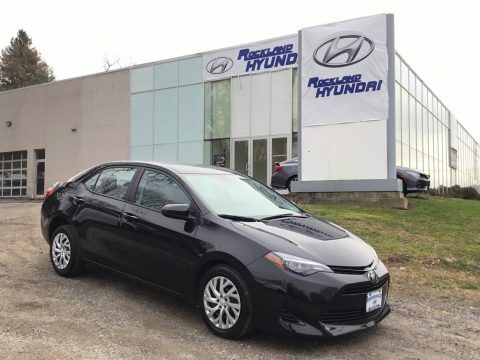 Please continue for more information regarding this 2017 Toyota Corolla LE with 44,317mi. The Toyota Corolla LE is economically and environmentally smart. Toyota clearly delivers on its promise to provide a fuel-efficient vehicle that has the great qualities you need in a vehicle. Based on the superb condition of this vehicle, along with the options and color, this Toyota Corolla LE is sure to sell fast. The quintessential Toyota -- This Toyota Corolla LE speaks volumes about its owner, about uncompromising individuality, a passion for driving and standards far above the ordinary. Just what you've been looking for. With quality in mind, this vehicle is the perfect addition to take home. SE HABLA ESPANOL! To view our entire inventory please visit our web site at www.rocklandhyundai.com or call one of our internet specialists (866) 682-6866. ROCKLAND HYUNDAI is proud to announce $ 000 DOWN FINANCING AND TOP DOLLAR FOR ANY AND ALL TRADES!!! Same great price whether it is cash or financed! No GIMMICKS! No HASSLE! Why buy from ROCKLAND HYUNDAI? We are the only one's to offer customers our Exclusive Brake Guarantee on all Pre-Owned vehicles.